If you've longed for a hassle-free way to set up an effective display at art fairs and shows, here's a versatile unit that makes sense. Assembled, the Display Wall is very stable, with sturdy aluminum components, adjustable tilt, and vertical shelf positioning. Dismantled, the entire unit slides into a 7" × 54" (18 cm × 137 cm) zippered canvas carrying bag. With a combined weight of 16½ lbs. (7.5 kg), it's easy to move the display wall and all of its components from one location to the next. The unit consists of a 68" (173 cm) high folding vertical stand and three shelves — two 52" (132 cm) in length and one 36" (91 cm) in length. Each shelf supports up to 50 lbs. (23 kg) and holds framed pieces up to 1½" (4 cm) thick. Additional shelves are available in sets of two, and a 12" (30 cm) extension piece can be purchased for added height. Testrite Easel Extension — Slips on top of the Testrite #500 Studio Easel to accommodate larger canvases. 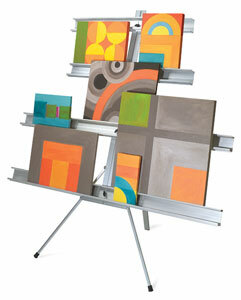 Locks into place and extends the easel up to 12" (30.5 cm) higher. Aluminum.